York House is a fine 17th century building, with a fascinating history, set in beautiful grounds on the banks of the River Thames. The following rooms are available for hire and are suitable for a variety of functions. The Clarendon Hall and Hyde Room. These are suitable for weddings, concerts, musicals, plays, fairs and large meetings. The rooms are licensed for public music, dancing and stage plays. The Salon, the Terrace Room and Terrace Parlour. These are suitable for receptions and meetings but music or dancing is not permitted. The Terrace Room has access to the gardens. The Council Chamber. This is suitable for meetings and seminars. Civil Marriage Ceremonies and Civil Partnership Ceremonies. The Terrace Room and Salon are licensed for ceremonies. Information on Ceremonies and on Receptions can be obtained on our weddings page or on request from the Lettings Officer. All rooms can be hired in conjunction with each other to suit your requirements. Visit our York House FAQ page for more information. External caterers are welcome at York House. To assist you in choosing a caterer for your event we have compiled a list of caterers that have worked at York House. 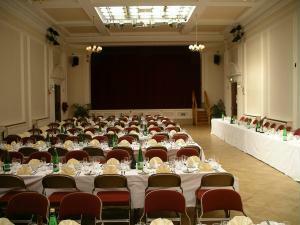 The hall is 23 metres by 10 metres and can hold 250 people seated theatre style and 150 people seated for a formal dinner. It has a stage, dressing rooms and a grand piano. A PA system and stage lighting are available for hire. The room is 9 metres by 10 metres and it can hold 60 people seated for a formal dinner or 70 seated theatre style. It can accommodate 20-30 for a boardroom style meeting. This room is 10 metres by 7 metres and can accommodate 60 people seated for a formal dinner, 70 seated theatre style or 20 for a boardroom style meeting. This room is 9.5 metres by 6 metres and can accommodate 20 people seated for a formal dinner or for a boardroom style meeting. It can seat 40 people in a theatre style layout. This room is 4 metres by 5 metres and can accommodate 8 people seated for a formal dinner/meeting. This room is 10 metres by 6.5 metres and can seat 60 people in fixed tiered seating. A dais can seat an additional 7 people. There is a two hour maximum stay (9am to 5pm) public car park available at the venue and a multi-story car park in nearby Arragon Road. Twickenham Railway Station is nearby in London Road and a number of buses serve the area. More details on how to get to York House (pdf, 170KB). Find out more about York House weddings.